Egg tempera is renown for its luminosity, making it an ideal medium for rendering the human face. In this workshop you will learn every step of how to develop a portrait in egg tempera, with ongoing individual instruction and critiques from Koo. Koo explains the traditional Old Master palette used to develop flesh tones. 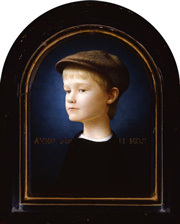 She will also work on a painting of her own, so you can see firsthand how she develops her egg tempera portraits. The workshop includes a photography session in which you learn how to light and pose a model, to create visually strong photographs that already look like beautifully designed paintings. You may work from your own photographs, from photos supplied by Koo, or from a copy of an Old Master egg tempera portrait. Open to all levels of painters, from beginner to advanced. A demonstration on the essentials of working in egg tempera will be provided for beginning students.